Miniature. Tempera, ink and gold on vellum. Three nobili and a notary from the Fornari family. 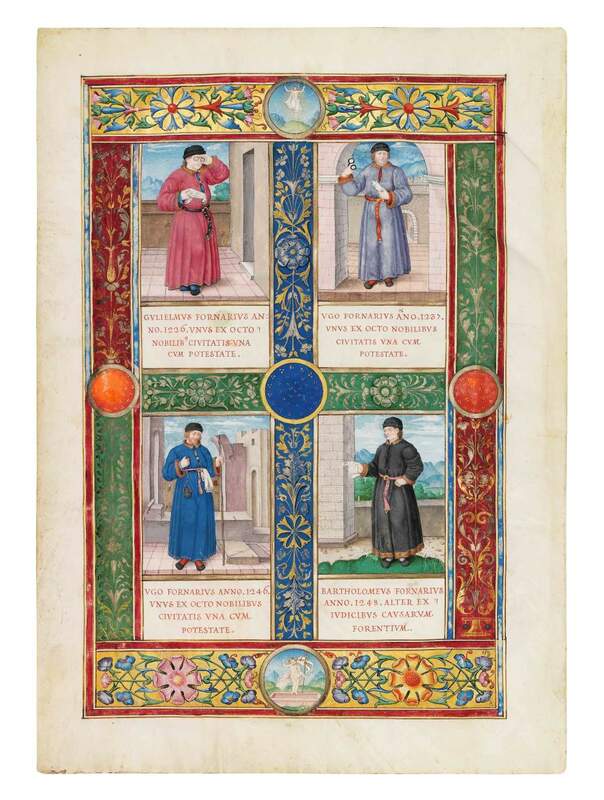 Full-page miniature from a family chronicle commissioned by the Genoese Fornari family. The Fornari family is documented in Genoa since the 12th century, where they, for centuries were involved in the municipal government, often in the highest functions. Here, four 13th-century Fornari men are presented, each identified by a Latin caption. They are dressed in ankle-length, girded coats and wear black caps, customarily attributed to scholars. The men in the upper compartments (Guglielmo and Ugo) have glasses and hold scrolls. In the lower compartments, only the man at right, Bartolomeo, holds a document, whereas the man at left, the second Ugo, grasps a stick. Guglielmo and the two Ugos were nobili who were in charge of the Genoa city council finances, while Bartolomeo Fornari was known as a notary. In the early 16th century, family chronicles were popular commissions among Italy’s highest nobility. Although meant to preserve the family’s glorious history, only a few such manuscripts have survived intact. Another miniature of the Fornari chronicle, showing Dondedeo Fornari, is on offer from Dr. Jörn Günther Rare Books.